Selling weighed on all the main categories of global markets last week, based on a set of exchange-traded products. The biggest slide: stocks in emerging markets. The Vanguard FTSE Emerging Markets ETF (NYSEARCA:VWO) slumped a hefty 3.8% in the US holiday-shortened trading week through September 7. The decline left the ETF at its lowest close in more than a year. An escalating trade war is a factor weighing on sentiment for assets in emerging markets. Rising interest rates in the US are another. Foreign junk bonds posted the smallest loss last week. The VanEck Vectors International High Yield Bond ETF (NYSEARCA:IHY) shed a relatively light 0.1%. Last week’s selling nicked an ETF-based version of the Global Markets Index (GMI.F). 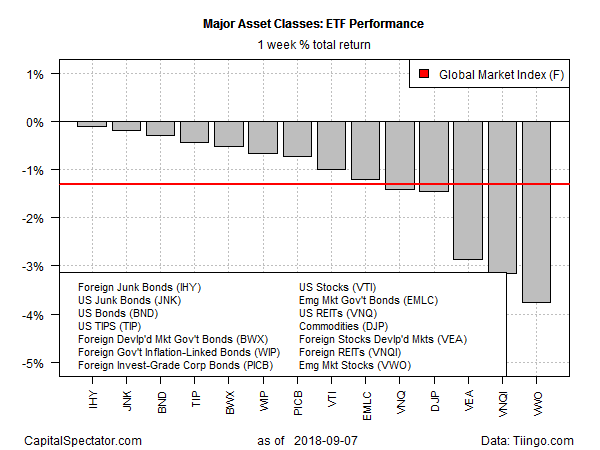 This investable, unmanaged benchmark that holds all the major asset classes in market-value weights slumped 1.3% last week – its first weekly decline in a month. For one-year results, US stocks are still the extreme bullish outlier. The Vanguard Total Stock Market ETF (NYSEARCA:VTI) posted a strong 19.5% total return for the 12 months through last week’s close. No other corner of the major asset classes comes close. 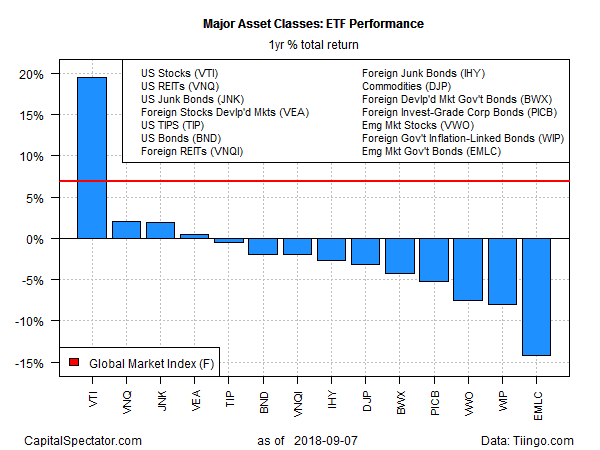 The second-best performance for the one-year change: the Vanguard Real Estate ETF (NYSEARCA:VNQ), which is up a modest 1.8% for the trailing one-year period. The biggest setback over the past year: the VanEck Vectors J.P. Morgan EM Local Currency Bond ETF (NYSEARCA:EMLC), which has lost 14.2% as of Friday’s close versus the year-ago level (even after factoring in distributions). For perspective, GMI.F is up 6.9% over the past year in total return terms. For current drawdown, broadly defined commodities continue to post the biggest decrease. The iPath Bloomberg Commodity Index Total ReturnSM ETN (NYSEARCA:DJP) is nursing a nearly 50% peak-to-trough decline. At the opposite extreme, US junk bonds have a virtually nil drawdown at the moment, based on the SPDR Bloomberg Barclays High Yield Bond ETF (NYSEARCA:JNK). 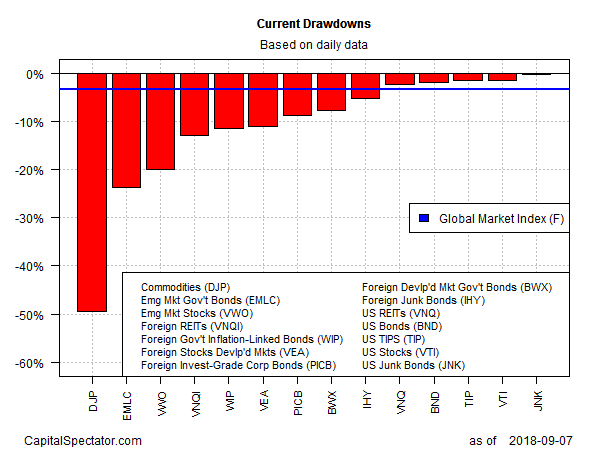 GMI.F’s current drawdown is a mild -3.3%.